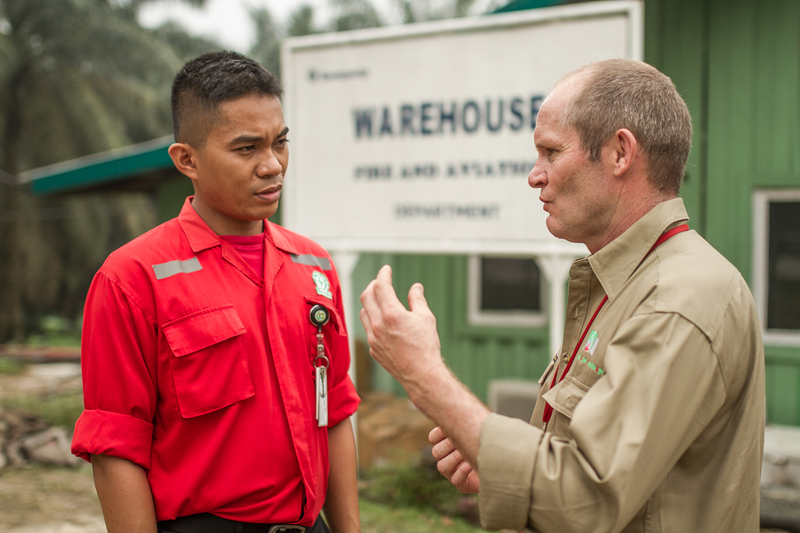 Robert Webb, Wildfire Suppression and Mitigation Specialist from the Natural Asset Protection Agency (NAPA), visited APRIL’s Fire Suppression team in Riau to observe and assess fire suppression activities in the region. This is his account of the days spent with the team. ( October,2 ). 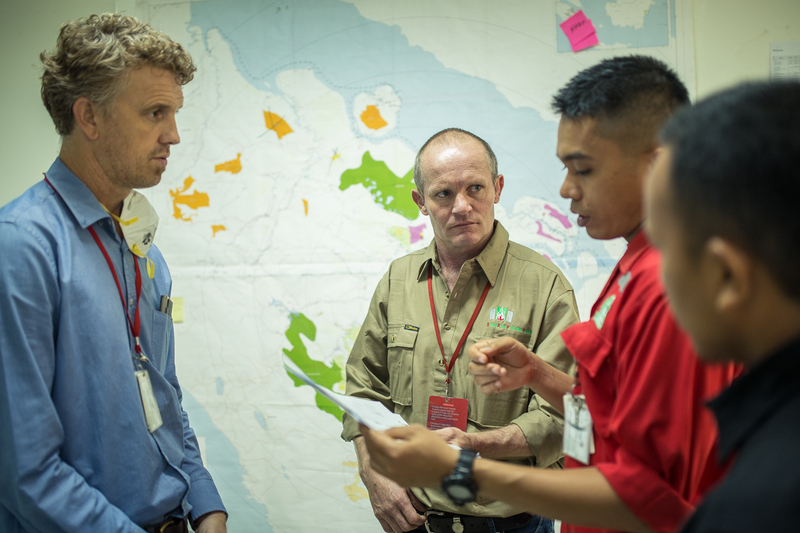 Day 1 of my independent review and assessment of APRIL’s wildfire suppression capacity commenced at the APRIL Fire Control Centre Kerinci. I was given the opportunity to view and ask questions regarding the overall management of wildfire on and off concession. What was initially apparent were the similarities between APRIL’s fire response protocols and those of other major wildfire prone regions globally such as Australia and USA. A clear line of communication between those who had detected the fire (emergency phone number) and the Control Centre was evident. An initial SITREP (situation report) and naming of incident proved to me that I may have been in any regional Fire Control Centre anywhere in the world. On the whole, I find the system to be well organised. It must be stated, however, that especially on lowlands, the ferocity and spread of fires are much lower than typically experienced in Australia and in the US or on mineral land plantations in Indonesia. The smoke and haze that peat fire produces, though, are unparalleled. The complexities of wildfire ignition sources were confirmed to me in terms of land claim and off concession land clearing being the major factor. A landscape approach with input from all stakeholders seems to be the only solution and it is obvious that APRIL is working hard as a contributor to this process. However, this is a process that will take a significant amount of time. The haze monitoring (PM.10) equipment is an APRIL initiative that provides real time air quality recordings, which will in turn be made available to the public so that appropriate action can be taken to mitigate respiratory ailments. In the afternoon I ventured out of Kerinci to a burn site that was designated as “community land” and was a significant distance from any APRIL estate. This land, approximately 200 hectares of lowland peat, had been recently burned. The haze produced as a result of this fire would have been incredibly hazardous. It was ‘refreshing’ to get my feet and hands ‘into the dirt’ and encounter first-hand what the people of Riau experience daily. In my opinion and from my experience, these fires are amongst the most challenging in the world. The question I had in mind was, “Who is suppressing these challenging fires?” By the end of the day, it was obvious. APRIL is going beyond its boundaries to help its communities in an unprecedented effort to protect the community from peatland fire and haze. This effort costs APRIL financially but that cost will be returned in social capital over time through the protection of its neighboring community’s health.